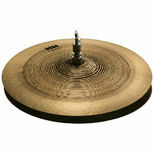 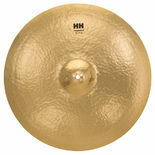 The Sabian 10″ HH Alien Disc was designed for Will Calhoun. 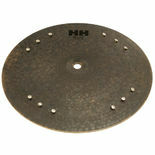 Spacey effect of solid bronze pierced with sizzling rivets is a funky piece of sound. 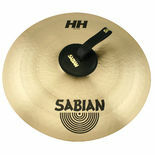 The Sabian 20" HH Suspended Cymbal has a rich, full-bodied warm sound that builds smoothly for crescendos, or crashes boldly for accents. 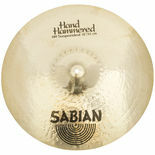 This Sabian 17" HH Suspended Cymbal has a rich, full-bodied warm sound that builds smoothly for crescendos, or crashes boldly for accents. 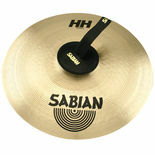 The Sabian 19" HH Suspended Cymbal has a rich, full-bodied warm sound that builds smoothly for crescendos, or crashes boldly for accents. 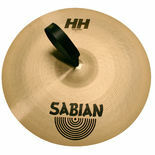 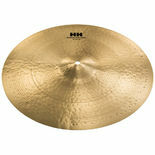 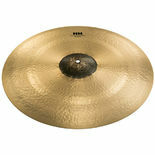 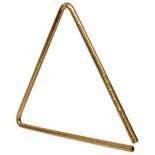 The Sabian 19 HH Viennese Pair is medium-weight cymbal models respond with fuller sounds and moderate decay. The Sabian 17" HH Thin Crash Cymbal features a full-bodied musical response that is low, dark and warm but with rapid decay. 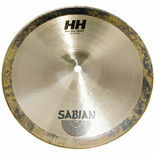 The Sabian HH Mid Max Stax includes a 10″ Max Stax China Kang and a 10″ Max Stax Splash stacked on each other. 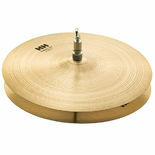 Great for blasts of white noise.